Nathaniel is using this site to learn Pascal and, as requested on our Programs page, makes his own contribution after coming up with a fine idea to make use of some basic language features. 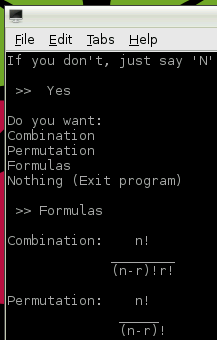 The Math Forum has a clear explanation of the formulae used in this program for permutations and combinations. Technical features and code (which you can compile in either Lazarus or Delphi) follow these screenshots of test runs on a PC and a Raspberry Pi. 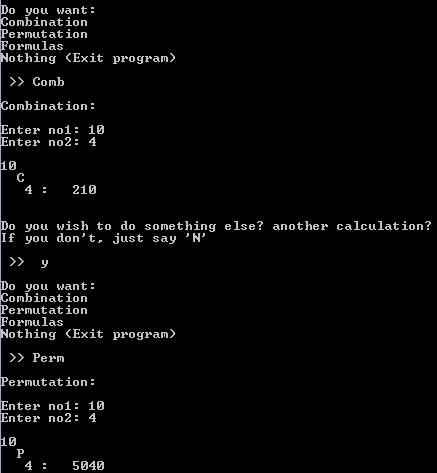 Can you think of two ways of making this program handle larger input values?